Helena Rubinstein (born Chaja Rubinstein; December 25, 1872 – April 1, 1965) was a Polish-American businesswoman, art collector, and philanthropist. A cosmetics entrepreneur, and was the founder and eponym of Helena Rubinstein Incorporated cosmetics company, which made her one of the world's richest women. Rubinstein was the eldest of eight daughters born to Polish Jews, Augusta – Gitte (Gitel) Shaindel Rubinstein née Silberfeld and Horace – Naftoli Hertz Rubinstein; who was a shopkeeper in the city of Kraków in Lesser Poland, which became part of Austria-Hungary following the partitions of Poland in the late 18th century. The existentialist philosopher Martin Buber was her cousin. She was also the cousin of Ruth Rappaport's mother. Diminutive at 4 ft. 10 in. (147 cm), Rubinstein emigrated from Poland to Australia in 1896, with no money and little English. Her stylish clothes and milky complexion did not pass unnoticed among the town's ladies, however, and she soon found enthusiastic buyers for the jars of beauty cream in her luggage. She spotted a market where she began to make her own. A key ingredient of the cream, lanolin, was readily at hand. Coleraine, in the Western Victoria region, where her uncle was a shopkeeper, might have been an "awful place" but was home to some 75 million sheep that secreted abundant quantities of wool grease or wool wax, chemically known as lanolin. These sheep were the wealth of the nation and the Western District's vast mobs of merinos produced the finest wool in the land. To disguise the lanolin's pungent odour, Rubinstein experimented with lavender, pine bark and water lilies. Rubinstein had a falling out with her uncle, but after a stint as a bush governess began waitressing at the Winter Garden tearooms in Melbourne. There, she found an admirer willing to stump up the funds to launch her Crème Valaze, supposedly including herbs imported "from the Carpathian Mountains". Costing ten pence and selling for six shillings, it walked off the shelves as fast as she could pack it in pots. Known to her customers only as Helena, Rubinstein could soon afford to open a salon in fashionable Collins Street, selling glamour as a science to clients whose skin was "diagnosed" and a suitable treatment "prescribed". Sydney was next, and within five years Australian operations were profitable enough to finance a Salon de Beauté Valaze in London. As such, Rubinstein formed one of the world's first cosmetic companies. Her business enterprise proved immensely successful and later in life, she used her enormous wealth to support charitable institutions in the fields of education, art and health. In 1908, she married the Polish-born American journalist Edward William Titus in London. They had two sons, Roy Valentine Titus (London, December 12, 1909–New York, June 18, 1989) and Horace Titus (London, April 23, 1912–New York, May 18, 1958). They eventually moved to Paris where she opened a salon in 1912. Her husband helped with writing the publicity and set up a small publishing house, published Lady Chatterley's Lover and hired Samuel Putnam to translate famous model Kiki's memoirs. Rubinstein threw lavish dinner parties and became known for apocryphal quips, such as when an intoxicated French ambassador expressed vitriol toward Edith Sitwell and her brother Sacheverell: "Vos ancêtres ont brûlé Jeanne d'Arc!" Rubinstein, who knew little French, asked a guest what the ambassador had said. "He said, 'Your ancestors burned Joan of Arc.'" Rubinstein replied, "Well, someone had to do it." At another fête, Marcel Proust asked her what makeup a duchess might wear. She summarily dismissed him because "he smelt of mothballs." Rubinstein recollected later, "How was I to know he was going to be famous?" From 1917, Rubinstein took on the manufacturing and wholesale distribution of her products. The "Day of Beauty" in the various salons became a great success. The purported portrait of Rubinstein in her advertising was of a middle-age mannequin with a Gentile appearance. In 1928, she sold the American business to Lehman Brothers for $7.3 million, ($88 million in 2007). After the arrival of the Great Depression, she bought back the nearly worthless stock for less than $1 million and eventually turned the shares into values of multimillion dollars, establishing salons and outlets in almost a dozen U.S. cities. This saga, and Rubinstein’s early business career, has been the subject of a recent Harvard Business School case. Her subsequent spa at 715 Fifth Avenue included a restaurant, a gymnasium and rugs by painter Joan Miró. She commissioned artist Salvador Dalí to design a powder compact as well a portrait of herself. Freed of her former marriage vows, in 1938 Helena readily married Prince Artchil Gourielli-Tchkonia (1895–1955), whose somewhat clouded matrilinear claim to Georgian nobility, as that of Prince Artchil Gourielli-Tchkonia (sometimes spelled Courielli-Tchkonia; born in Georgia, February 18, 1895, died in New York City November 21, 1955), stemmed from his having been born a member of the untitled noble Tchkonia family of Guria, enticing the ambitious young man to appropriate the genuine title of his grandmother, born Princess Gourielli. Self-styled Prince Artchil Gourielli-Tchkonia was 23 years younger than Rubinstein. Eager for a regal title to call her own, Rubinstein pursued the handsome youth avidly, coming to name a male cosmetics line after her youthful prized catch. Some have claimed that the marriage was a marketing ploy, including Rubinstein's being able to pass herself off as Helena Princess Gourielli. A multimillionaire of contrasts, Rubinstein took a bag lunch to work and was very frugal in many matters, but bought top-fashion clothing and valuable fine art and furniture. Concerning art, she founded the Helena Rubinstein Pavilion of Contemporary Art in Tel Aviv and in 1957 she established the Helena Rubinstein travelling art scholarship in Australia. In 1953, she established the philanthropic Helena Rubinstein Foundation to provide funds to organizations specializing in health, medical research and rehabilitation as well as to the America Israel Cultural Foundation and scholarships to Israelis. In 1959, Rubinstein represented the U.S. cosmetics industry at the American National Exhibition in Moscow. Beginning in 1958 a £300 annual Rubinstein Prize was awarded for portraits by Australian artists. Prizewinners included Frank Hodgkinson 1958; Charles Blackman 1960; William Boissevain 1961; Margaret Olley 1962; Vladas Meskenas 1963; Judy Cassab 1964, 1965; Jack Carington Smith 1966. Called "Madame" by her employees, she eschewed idle chatter, continued to be active in the corporation throughout her life, even from her sick bed, and staffed the company with her relatives. Rubinstein died April 1, 1965 from natural causes and was buried in Mount Olivet Cemetery in Queens. Some of her estate, including African and fine art, Lucite furniture, and overwrought Victorian furniture upholstered in purple, was auctioned in 1966 at the Park-Bernet Galleries in New York City. One of Rubinstein's numerous sayings was: "There are no ugly women, only lazy ones." A scholarly study of her exclusive beauty salons and how they blurred and influenced the conceptual boundaries at the time among fashion, art galleries, the domestic interior and versions of modernism is explored by Marie J. Clifford (Winterthur Portfolio, vol. 38). A feature-length documentary film, The Powder and the Glory (2009) by Ann Carol Grossman and Arnie Reisman, details the rivalry between Rubinstein and Elizabeth Arden. She was "the first self-made female millionaire, an accomplishment she owed primarily to publicity savvy. She knew how to advertise—using 'fear copy with a bit of blah-blah'— and introduced the concept of 'problem' skin types. She also pioneered the use of pseudo-science in marketing, donning a lab coat in many advertisements, despite the fact that her only training had been a two-month tour of European skin-care facilities. She knew how to manipulate consumers' status anxiety, as well: If a product faltered initially, she would hike the price to raise the perceived value." In 1973, the company Helena Rubinstein, Inc. was sold to Colgate Palmolive, and is now owned by L'Oréal. She was mentioned by the Austropop/comedy band Erste Allgemeine Verunsicherung in their debut album in 1978, in the song "Pustel Gunkel". 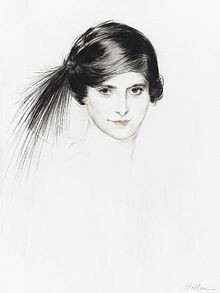 The Helena Rubinstein portrait prize, also known as "Boans – Helena Rubinstein portrait prize", was an annual prize of £300 for portraiture by an Australian artist, awarded by the Helena Rubinstein Foundation (disbanded 2011), and mostly staged at the Claude Hotchin Gallery in Western Australia. The L'Oréal-UNESCO Awards for Women in Science are also known as the Helena Rubinstein Women in Science Awards. The Helena Rubinstein Foundation, which had been established in 1953, operated through 2011, ultimately distributing nearly $130 million over the course of six decades, primarily to education, arts and community-based organizations in New York City. The foundation was a longtime supporter of children's programming for New York City's PBS affiliate WNET. The Manhattan Jewish Museum’s exhibition “Helena Rubinstein: Beauty Is Power,” the first museum show devoted to Rubinstein, was held from October 31, 2014 until March 22, 2015. The musical War Paint dramatizes her rivalry with competitor Elizabeth Arden. After a wildly successful out of town tryout at Chicago's Goodman Theater, the show opened on Broadway at the Nederlander Theatre on April 6, 2017, earning four Tony Award nominations, including Best Actress in a Leading Role for Patti LuPone's portrayal of Rubinstein as well as for Christine Ebersole in the same category for her role as rival, Arden. The comedy Lip Service by the Australian dramatist John Misto chronicles the life and career of Rubinstein and her rivalry with Elizabeth Arden and Revlon. Lip Service premiered on 26 April 2017 at the Park Theatre, London, under the title Madame Rubinstein, before opening at Sydney's Ensemble Theatre in August of the same year. ^ "Helena Rubinstein". Biography.com. Retrieved May 19, 2017. ^ Woodhead, Lindy (2004). War Paint (1st ed.). UK: Wiley. ISBN 0471487783. ^ "The Beauty Merchant". Time. April 9, 1965. Retrieved August 8, 2008. ^ "Oral history interview with Ruth Rappaport – USHMM Collections Search". collections.ushmm.org. Retrieved October 26, 2015. ^ O'Higgins, Patrick (1971). Madame: An Intimate Biography of Helena Rubinstein. Viking Press. p. 17. ^ Kanfer, Stefan. "The Czarinas of Beauty". city-journal.org. Retrieved August 8, 2008. ^ "Geoff Jones". Working Knowledge. Retrieved March 24, 2019. ^ Poynter, J. R. "Rubinstein, Helena (1870–1965)". Australian Dictionary of Biography. Australian National University. Retrieved December 20, 2010. ^ Green, Penelope (February 15, 2004). "The Rivals". The New York Times. Retrieved August 8, 2008. ^ Center, Foundation. "Helena Rubinstein Foundation to Close at Year's End". ^ Rosenberg, Karen (October 30, 2014). 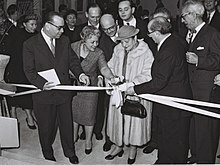 "Celebrating Helena Rubinstein at the Jewish Museum" – via NYTimes.com. ^ "Helena Rubinstein: Beauty Is Power". ^ Rubenstein, Helena (1938). Food For Beauty (First ed.). New York: Ives Washburn. p. 245. Wikimedia Commons has media related to Helena Rubinstein.